I was really impressed with the food on my Colorado trip. 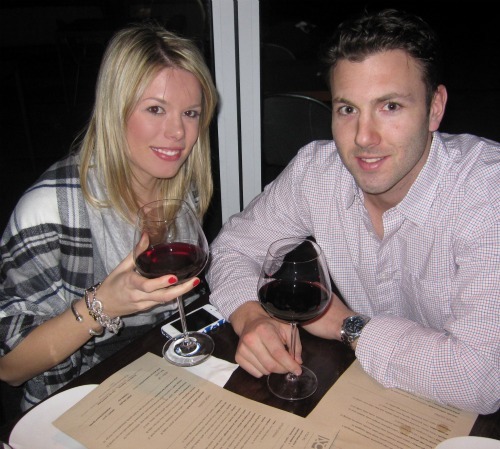 One of my favorite restaurants was Vin48 Restaurant and Wine Bar in Avon. 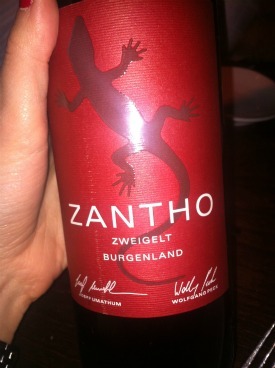 Our waiter helped us pick out this Austrian red as an alternative to my go-to Pinot Noir. I did a little research when I got home about the grapes and learned it's a popular wine in it's homeland. I love expanding my vino knowledge and hopefully someday I'll know what I'm talking about. The small plates were the best part of the meal. The sweet potato ravioli was delish. Saving the best for last. 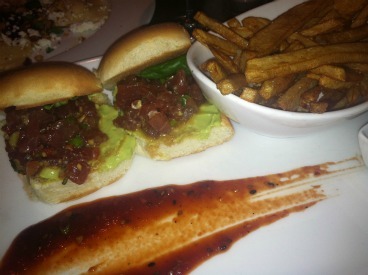 These ahi tuna tartare sliders were amazing. I had every last drop of that chili bbq sauce. So, who wants to go back with me? YUM. This food and wine looks amazing!!! I'd definitely go back! I love learning more about wine too! And I love small plates - tapas restaurants are my favorite because I like getting to try a variety. 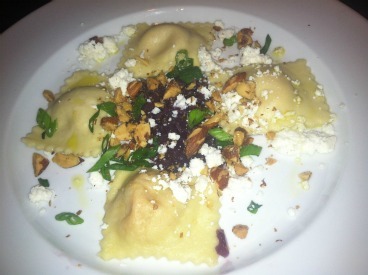 The sweet potato ravioli looks to die for! Yum! Your partner kind of reminds me of Bradley Cooper! I am your newest follower! But looks so delicious. I am horrible when it comes to my wine knowledge, this makes me want to learn a tad more so I know something about it, haha! That's a great pic of you two! :) Looks like a great dinner! so jeal you went to CO :-) My fam lives there, and i wish I could go every weekend! That looks like an insanely delish dinner... have a sip (or dozen) of wine for me!! That looks so amazing! Such an adorable dinner date!